get the right size bag for your can. Choose your gallon capacity below. Below are dimensions for the BAGS we stock. These are not dimensions for trash cans. 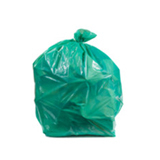 TIP: Bag dimensions need to be larger than the trash can to allow for overhang, grasp, and closure. 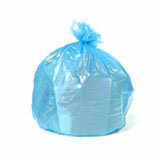 linear low density (lld) trash bags are strong, flexible and highly resistant to puncturing and tearing. They are ideal for kitchen trash, construction debris or trash that includes glass, metal, wood, cardboard or irregular shaped items. high density (hd) can liners are a more cost-effective option. Manufactured from different resins, they are thinner than Linear Low Density bags and are not as puncture resistant, yet they can carry very heavy loads. 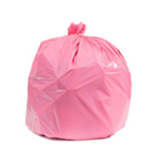 Whatever your trash bag needs, we have the right one for you. We will be closed on April 20th through April 27th for the holiday of Passover. All orders placed during this time will be shipped on April 29th - 30th. This all purpose extra heavy poly sheeting is great for painting or any renovation project, they're often used as a moisture barrier as well. You'll love the quality and convenience at Plasticplace. 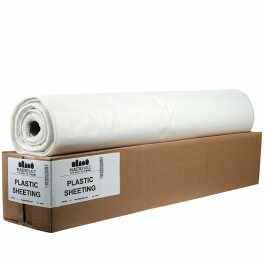 If you are looking for a large quantity be sure to email info@plasticplace.com to have a custom quote prepared. This bag has been recommended by our customers as a good fit for the cans you see below. pay less when you order 8+ cases site wide, learn more. Don't need 8 cases of a single product but want to cash in on our Volume Discount? No worries. We've got your back. That's why we offer a volume discount that will help you save even when you purchase a TOTAL of 8 cases of a variety of products! That's right. Any combination. Any Trash Bags. Just make sure your TOTAL is at least 8 cases. Our customers usually order between 8 and 24 cases. The price is significantly better than when ordering one or two cases. 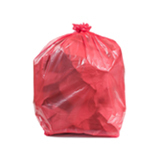 What's more: the discount works when ordering 8 total cases of any trash bags. That's right. Any combination. Any Trash Bags. Just make sure your TOTAL is at least 8 cases. Put a total of 8 cases or more of any case combination into your cart and the shopping cart will automatically adjust to bill only the price that is listed on each product's detail page. For example: order 3 cases of X 2 cases of Y 3 cases of Z and only get charged the listed price. LARGER QUANTITY? request a quote! Want to pay by check or purchase order? How would you rate the quality of the bags you ordered? I ordered this to use on my new shade house for my orchids here in South West Florida in anticipation of the cold weather. It arrived in such a timely fashion and is perfect. FREE SHIPPING - Standard shipping is free on all orders. Expedited delivery is available at an additional cost. SAME DAY SHIPPING - Orders for in-stock items that are placed before 2:00 PM EST usually ship the same day. RETURNS - We hope you are 100% satisfied with your purchase. But in case you're not, we will gladly accept returns or exchanges within 30 days. 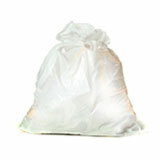 * Here on Plasticplace.com, dimensions refer to the dimensions of the trash bag, not the trash can. 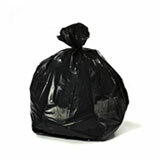 * The trash bag dimensions need to be larger than your trash can measurements to ensure a proper fit. Take the perimeter (sum of all the sides) of your trash can and divide by 2. This will be the width of your trash bag. 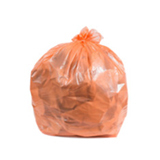 Example: Perimeter of can = 32", Width of trash bag = Perimeter (32) divided by two = 16"
Take the diameter (width of your trash can) and multiply by 3.14 (pi). Take this number and divide by 2. 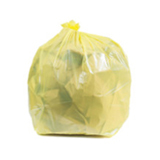 Example: Diameter = 16", Width of trash bag = (16 x 3.14)/2 = 25"
Take the height of your can, and add four inches for overhang plus half the width of the can (or diameter), this ensures there’s enough material to cover the bottom of your can. Example: Bag height needed: 42 (can height) + 4 (overhang) + 12 (1/2 can width) = 60. Not sure what GAUGE or POLYETHYLENE are? 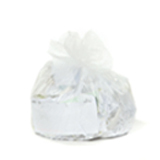 Find definitions for some key trash bag terms so you can make an educated purchase. It pays to be friends with us. Like us on social media for discounts, new products & flash sales.